The Scalloped Flap Cross body bag is just stunning. Features fancy hardware from Sallie Tomato and gorgeous cork. Created using two separate hooping. First created is the front scalloped flap using a non-woven material such as Cork or Vinyl. The second hooping attaches the zipper, front, back, hidden front pocket and top cork tabs for D-rings. The Scalloped flap bag is made entirely in the hoop, ITH, using an embroidery machine. This bag has no raw edges inside and is clean finished. Scalloped Flap Cross Body Zipper Bag – ITH. It is a perfect use of Cork scraps too only requiring a small strip along the top zipper and then the scalloped front flap. Simply choose your favorite quilt cotton and coordinating Cork or Vinyl and whip one or two up. 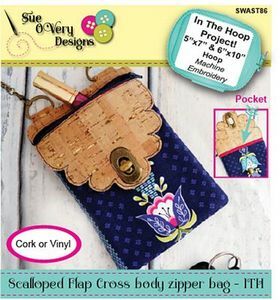 This cross body style bag comes in two sizes, small for the 5in x 7in hoop and the large for the 6in x 10in or larger. Bag finished dimensions small 5in w x 6-3/4in t and the large, 6in w x 10in tall, horizontal shape. The flap measures approximately 5in w x 3-1/2in tall for the small and 5in w x 4-1/2in tall for the large. Hardware required : (2) D-rings 3/4in – 1in, one zipper 8in – 12in, 47in metal bag chain and 1-1/2in turn lock.